Note: At BlackBeards Adult Resort, we receive a large number of e-mails on a daily basis; we ask that you first read through all the information that is already provided on our web site for pricing, accommodations and general questions. However, please feel free to e-mail or call us with any other questions or concerns you might have about a Dominican Adult vacation. FAQs – click on a question to go directly to that specific answer. Questions are categorized for ease of use. What exactly is BlackBeards Adult Resort? What is the atmosphere like at BlackBeards Resort? Will I fit in if I am over 65 and is it easy to get into the swing of things? Do you have Phone/Internet service? Does Blackbeards offer “all inclusive” packages? Are Passports and/or Visas required? Do I need a tourist card? What is the weather like in the Caribbean/Dominican Republic? Is it a big problem if I do not speak Spanish? Are there Taxis available at the airport? Is airport pickup service available? How do I get around once I check in? Does BlackBeards accept major credit cards? Does BlackBeard's offer currency exchange services? Does Blackbeards accept Travelers Checks? Can I get money out of Dominican Banks? BlackBeards Adult Resort is a hotel catering to adults only (no one under 18 is allowed). Our discreet and safe resort is located in the beautiful upscale and gated beachside town of Costambar on the North coast on the Caribbean island of the Dominican Republic. What is the atmosphere like at BlackBeards Adult Resort? BlackBeards Adult resort offers a very casual, carefree, laid back, no pressure, and relaxed environment. We have numerous daily and nightly events around the pool and in our 2 different bars. Our dedicated staff will do whatever it takes to make your stay everything you ever dreamed of…and much, much more. Everyone fits in. We have many guests over 65. Additionally, our repeat business is 90% and there will always be other guests here that have been here several times. 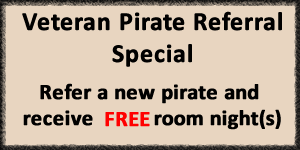 For you first timers, our management staff will walk you through our “House Rules” that will make you a regular “Pirate” in no time! Blackbeards is located on Costambar Beach, about 35 minutes from Puerto Plata International airport (POP) and about 1 ½ hours from Santiago International airport (STI). We highly recommend that you choose either POP or STI for your trip. Other airports are a considerable distance from here and we only offer airport pickup services, from these two airports. We are located a short 10 minute taxi ride from the center of Puerto Plata, 15 minutes from the Playa Dorada Plaza and Golf Club and 45 minutes from Sosua. Please see our “Where We Are and Getting Here” page. We are across the street from the beautiful Caribbean. The main part of the beach is about a 2 minute walk from the resort. Here, you will find chairs, umbrellas, beach bars, restaurants and souvenir shops. We take all reservations via our website . Due to the high volume of reservations, we take reservations “First Come-First Served”. If your reservation is within 30 days, we recommend that you call first for availability. We will confirm your reservation via email. Your credit card information guarantees your reservation, however, we do not charge your card. Pay cash when you arrive. There is a 20% surcharge on all credit card charges. Yes. You can feel comfortable walking or riding around the country and cities. But, just like any other country, common sense applies. Do you have Internet/Phone Service? There is a FREE internet station in our lobby. We do have WIFI and most guests can get connected in all of the common areas as well as the patio of their room. A public phone is also available for local calls. No we do not. Since opening our doors, BlackBeards Adult Resort has been committed to providing the best service at the best prices. In order to keep our prices as low as possible, we do not offer special travel packages, rates or discounts. A government mandated gratuity of 10% is included in all bar/restaurant charges. As with any fine establishment where service is first-rate, additional tipping at the end of your stay is customary, but never enforced. Blackbeard's offers a full service restaurant and is open from 8am until 11pm. We have a wide variety of local and international fare. Please take a look at our menus in the activities section. The prices are in pesos. Yes. We strongly adhere to “Beach Casual”. Shorts, tank tops, flip flops are the order of the day. No. The tap water is not safe to drink. However, there is no problem with using it to bath or brush your teeth. We have bottled water in the restaurant and in your room's minibar. Additionally, our ice is made from purified water. US citizens traveling abroad will be required to carry a passport. For travelers from outside the US, please check with your airline or travel agent regarding the requirements for your country. Yes, a tourist card (US$10), must be purchased when you enter the country and an airport departure tax of US$10 is charged when you leave (depending upon your airline). Tourist cards are now available for purchase online prior to your arrival at https://www.dgii.gov.do/Tturistaweb/ These charges MUST be paid in US Dollars. Again, check with your airlines. Absolutely gorgeous! This particular area of the Caribbean is very lucky to enjoy consistently good weather all year round. The days are sunny and the evenings are filled with warm tropical breezes. There is very little temperature change from Winter to Summer. Our atmosphere is casual and tropical attire is encouraged…don't forget the sunscreen. Click here for the latest weather. If your Spanish is somewhat rusty, don't worry. Everyone always seems to find a way to communicate with very little difficulty. We can arrange to have you picked up by our local taxi service. Just email us your flight schedule and we will make the arrangements for you and bill it to your room. We now provide taxi pickup service from both Puerto Plata and Santiago. The cost from Puerto Plata airport (POP) is $45 one-way – less (per person) if we are picking up more guests. Santiago airport (STI) is approximately 1 ½ hours away from us and the cost is $90.00 one way per person and drops to $50 per person for 2 and less if we are picking up more guests. We do not however pick up from Santo Domingo. Taxis are available from Santo Domingo at a cost of about $180.00 U.S. dollars. From Santo Domingo you can also travel by Caribe Tours Bus (6am to 6pm departures). The price is about US$10. You will also have taxi fares from the airport to the bus station and from the bus station to Blackbeards. You really don't need to. Costambar is conveniently located and local taxi service is always available. If you do decide to rent a car choose a reputable company and insist on full insurance. We strongly advise that you do not rent a motorcycle. The traffic here is very congested and the roads have many pot holes. Leave the motorcycle driving to the locals. Taxis are available at the hotel 24 hours a day. Taxis can also be picked up in town. For the more adventurous, try the local form of Dominican Taxi, a “motoconcho”. Most locals use these motorcycle taxis. For a nominal fee, they will take one or two people on their motorcycle. Just tell them where you where to go and you will be delivered. An experience NOT to be missed !!!!!!!!!!!!!!!! Yes! We have a wide variety of tours and recommend that you take advantage of your time here by getting out and seeing how beautiful this country is. We also have numerous “Taxi Tours” that can save you money and provide the comfort of round trip transportation without haggling. Yes, we have a licensed masseuse on the premises and a private massage room. Massages, manicures, and pedicures are available daily from 9am to 4pm. Closed on Sundays. Yes, we accept all major credit cards including Visa, Master Card, American Express, and Diners Club. We do have a 20% surcharge on credit card charges – so please bring cash and save your self some money. Does BlackBeards offer currency exchange services? Absolutely, as a service to our clients we offer peso exchange on the following currencies, US Dollar, Canadian Dollar, British Pounds and Euro. No, Sorry. Due to difficulties here with the Dominican Republic Banks refusal to accept them for deposit – we can no longer accept any type of Travelers Checks. Here in the Dominican Republic, the U.S. Dollar is the easiest to exchange and receives the most favorable exchange rate. Cash is readily available from ATM's throughout Puerto Plata. There is now an ATM right here in Costambar and in walking distance of the hotel. Cash is dispensed in Dominican Pesos only. The Maximum amount that can be withdrawn daily is normally US$450.00.